I’d usually much prefer reading a book to seeing a film but last Friday, my wife and I went to the free (the price was right) monthly film screening in the college’s Dickinson Theater. The film was Leave No Trace. I had never heard of it before seeing posters on the campus bulletin boards announcing the flick. The trailer intrigued me. It has a rare 100% positive rating on Rotten Tomatoes, so we went to see it. This 2018 film is directed by Debra Granik who also co-wrote the script. It is based on Peter Rock’s 2010 novel My Abandonment, which, in turn, is based on a 2004 news story about a father and daughter found living in a park in Portland, Oregon (see these articles). What stood out to me about the original story, which I vaguely recalled, was that the father had been homeschooling his daughter using only a Bible and a few old encyclopedias, and yet, despite the meager resources, she had apparently been thriving intellectually. 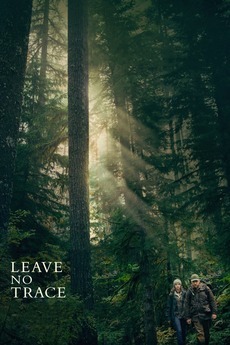 Leave No Trace (the title based on the hiker's motto) is about a veteran suffering with PTSD named Will and his daughter “Tom” who live in a park outside Portland, Oregon. Once discovered, well-meaning social workers try to resettle them in a normal setting, but the pair soon take off again for Washington state where they settle for a time in an RV park, before Will feels the urge to move on, while Tom decides to stay behind. Leave No Trace is distinctive and unusual for a modern film. The pace is slow and deliberate. The acting is excellent (with Ben Foster as Will and Thomasin Mckenzie as Tom, the focus of most the film). The green and rainy forest settings in Oregon and Washington are lush (reminded me of our visit to Snoqualmie, Washington). It is also usual in that the dialogue and action is as mild as the pace. There is no foul language, no graphic violence, no sexual content. It has a mild PG rating. Though it is packed with deep emotional content, the film has a wholesome, life-affirming vibe. It is a film where the actors make the people seem real and flawed but not unkind. There are no villains. Will loves his daughter and Tom respects her father. The social workers really want to help this family make it in the normal world. A neighbor boy welcomes Tom to the local 4-H club. The rabbit presentation scene is great! There is even a generally positive portrayal of Christians and church. A Christian tree farmer provides Will a job and a place to live and invites father and daughter to his church. When they visit, the pastor and people are a bit quirky but kind and welcoming. Look out for the liturgical dance scene! Perhaps it is an anti-war film, showing the impact war has on the warriors when they come home and the effect this has upon their families. It is about homelessness but has no political ax to grind. It seems more interested in the philosophical question of what makes a happy home and family. Is it having a conventional house in which to live or is it a generous and fulfilling relationship between parents and children? Should the state or the parents have the final say in what makes for a good education or a good home for a child? I don’t recommend many films, but this one is worth seeing. It will make you think and feel.